“The average temperature has increased by 1 to 1.5 degrees Celsius since the 1970s,” he said, and admitted the riper fruit is something he welcomes (in a region at 49.800 degrees North), but overall, it is not a good thing for winemakers in hotter climates, especially in Southern France. Dark storm clouds were gathering over the valley. 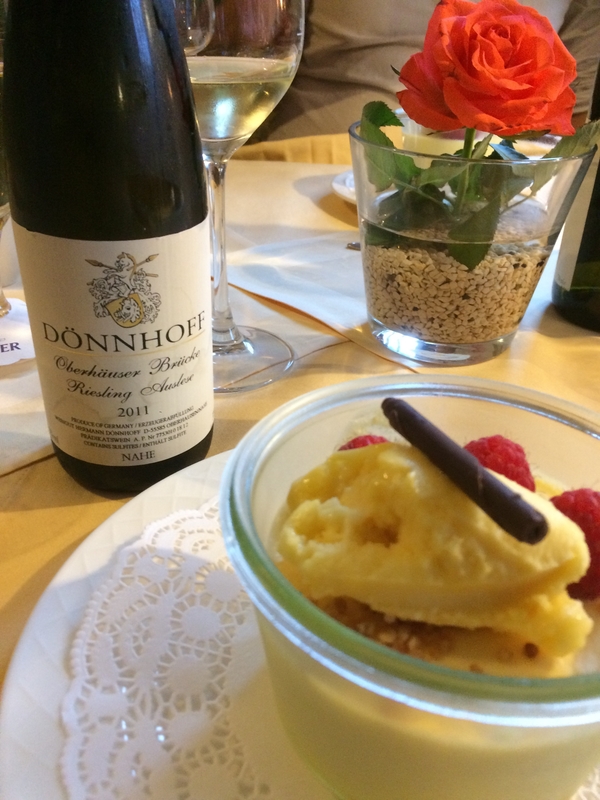 We got out at the Felsenberg vineyard and climbed though nettles and up the old stone stairs to the castle fort to see the view along the river. Big splotches of rain fell on my camera. 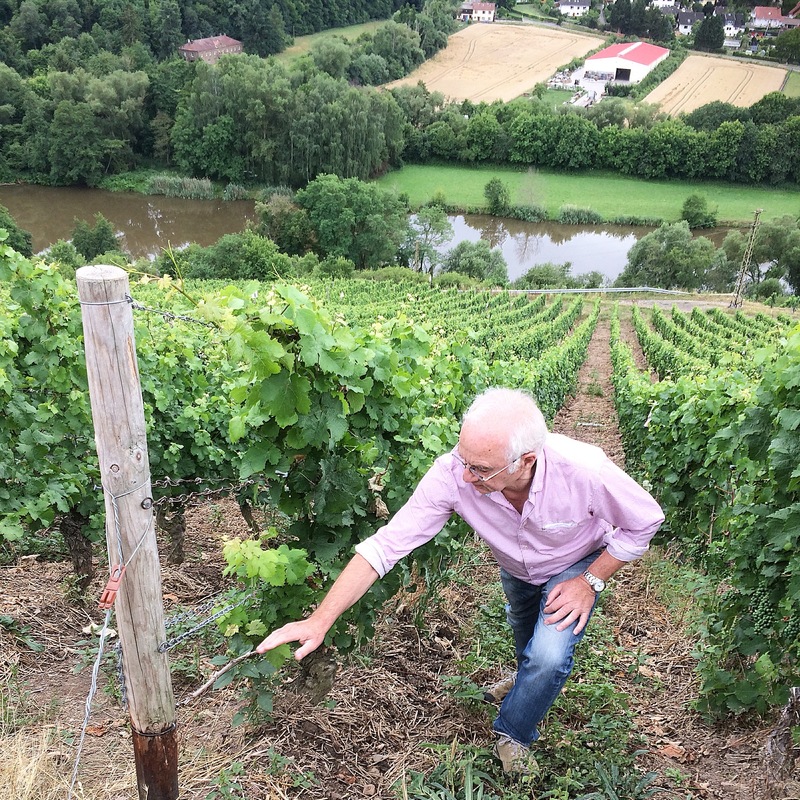 The biggest difference, he said, is in the vineyard… and then, we quickly went back to the van just before it began to downpour. A few minutes later, rivulets of water were flowing down from the vines towards the river. We drove slowly back to the village of Oberhausen, in sheets of rain along the winding roads down to the town. As we drove, Helmut was gauging how much of the slate and soil would be eroded and have fallen to the bottom of the hill. When we arrived at the restaurant in the village, the rain stopped. Like clockwork. Time for that beer. 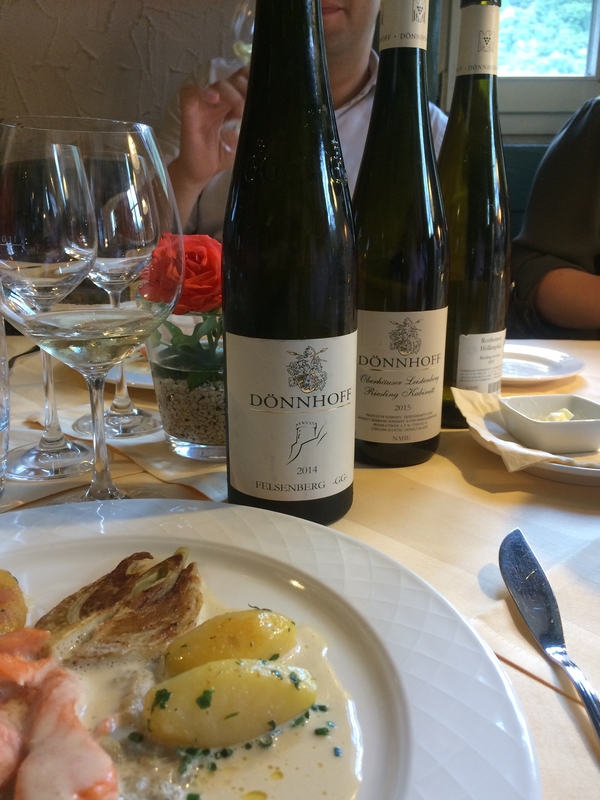 History: The Donnhoff family first came to teh Nahe region over 200 years ago. As time went by they turned their modest farm into a wine estate, with the acquisition of top vineyards. 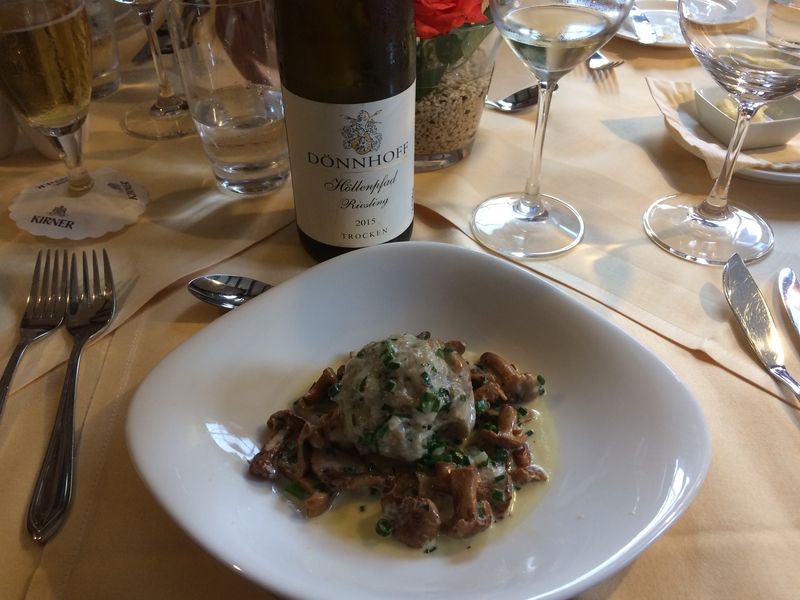 Helmut Donnhoff has not only been making wine here since 1971 but also purchased top sites, including Kirschheck, Dellchen and Krotenpfuhl. Grosse Lage: Hermannshohle (translation – Herman’s cave); Felsenberg (Rocky hill); Kirschheck (Cherry hedge); Dellchen (Little Dell); Brucke (The bridge); Krotenpfuhl (Pond frog); Kahlenberg (Bare hillside); Leistenberg (Slate hill); Hollenpfad (Path to hell).